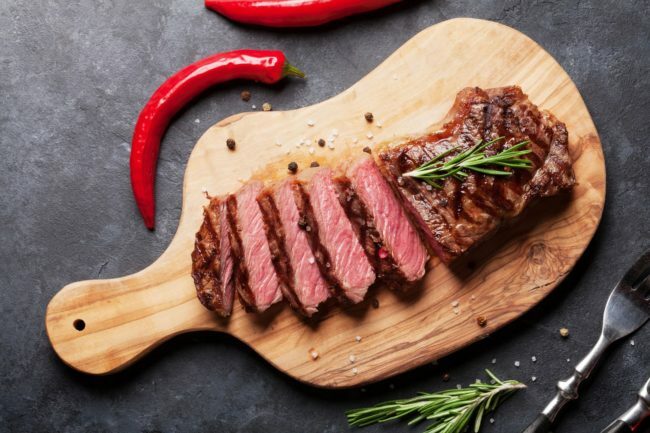 Eating red meat does NOT cause prostate cancer and does NOT make prostate cancer worse after diagnosis. Processed meats, maybe due to nitrites in them used as preservatives, can increase prostate cancer risk and progression. Limit cold cuts, hot dogs, sausage and the like. Eating overcooked red meat can increase prostate risk and progression likely due to the heterocyclic amines formed from high heat exposure. When you can, eat grass-fed, organic meat, though no studies to support eating this type of meat is protective against prostate cancer. Grass-fed meat is more nutrient dense than conventionally, grain-fed meat, however. You DO NOT need to eat red meat for any reason whatsoever. It’s not necessary for health maintenance or cancer protection. One exception might be in patients losing rapid weight from cancer progression. Red meat is high in glycine which may prevent muscle wasting. When eating red meat, add rosemary to it. At restaurants ask for a side dish of rosemary and pour it on the steak. Rosemary prevents the formation of heterocyclic amines and has anti-cancer qualities. Bottom line: It’s OK to occasionally enjoy a good medium rare steak if you want to. No pressure. It’s a matter of preference. And when you do have it grass-fed, organic when available – then add rosemary.